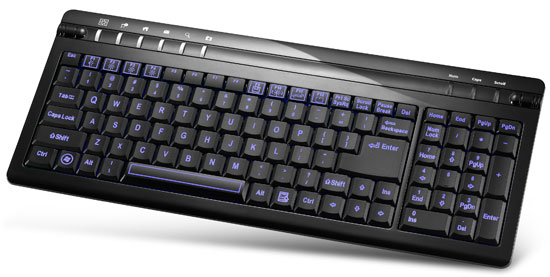 One of the most basic system components is the keyboard,which is the primary input device.It is used for entering commands and data into the system. 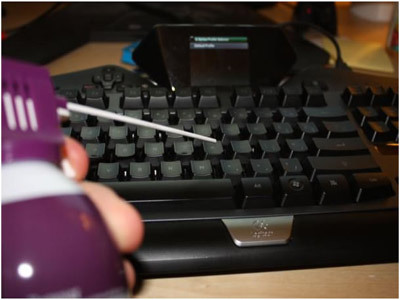 Taking a can of compressed air to a keyboard. Turn off the computer. Start by gently brushing the cleaning solution over the keys.spray a paper towel or a wipe instead of drenching the keyboard in cleaning fluid . We can get away with spraying compressed air in between the keys. To do a more thorough job, however, we want to use a capped pen, a mechanical pencil, or a closed pair of scissors to pop the keys up and off the keyboard. Once you've done that, commence deeper cleaning of the underlying surface. We might want to do this cleaning in batches of keys, just in case we forget which keys go where. 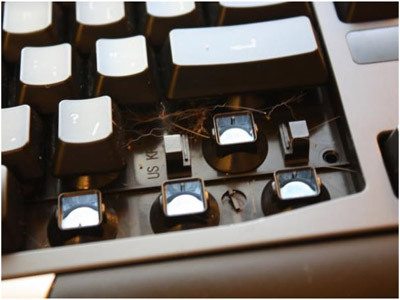 The "fun" method involves sticking our keyboard in the dishwasher and letting nature take its course. A few caveats: Gaming keyboards and wireless keyboards carry with them a greater degree of risk than standard keyboards do. To put it another way, we should steer clear of this method if our keyboard has a tiny display attached. Cover any open USB ports with plastic and tape, and, if we are cleaning a wireless keyboard, remove the battery prior to the washing. Set the dishwasher on a normal temperature with no heated drying--just air--and make sure that the keys are facing down. After keyboard is done bathing, we must let it dry completely before attempting to use it. Put it upside-down on the dish rack for a few days, stick it in sunlight for a few days, blast the insides with compressed air. We will find no perfect solution to getting every last bit of water out of the keyboard.